Also at Fan X last weekend was this wedding, between an Obi-Wan and a Satine cosplayer, and officiated by TCW alumni James Arnold Taylor and Anna Graves. How awesome is that? Elhoffer Design finally has for pre-order its Galactic Royalty collection, mostly pieces inspired by Padmé’s amazing wardrobe (and one piece based off of Leia’s Bespin gown from TESB). Pick from the Galactic Eclipse Oversize Sweater ($68), Galactic Picnic Cardi ($55 + $25 if you want roses sewn onto the sweater), and the Galactic Twilight Dolman ($60). First 50 orders will be delivered in time for SWCO; otherwise they will ship later in April. These are pre-order prices and will go up after a few more weeks. For the record, I ordered all three and I may get the Leia one too. Available in Bebe stores and online for $159, in both regular and petite lengths. Better jump on it fast because it’s selling out online. The Costume Player Facebook page posted this video of cosplayer who was representing Norway at an event called the Polymanga Global Easter Cosplay. In competitive cosplay, you kind of have to act out the character and this girl did an amazing job even if she didn’t take the top prize. If you follow links to her Facebook page, she also cosplays as Elsa from “Frozen,” Katniss Everdeen, Khaleesi, Rey, and a whole mess of other characters. Her Universe put on a “geek” fashion show/contest at SDCC. Your humble SWPAS web miss almost decided to go check it out until I saw the event went for an epic three hours into the night. (Non-geek fashion shows last fifteen minutes tops.) Since I’m not crazy about missing dinner or walking alone to my car at night, I passed on it, which is too bad. 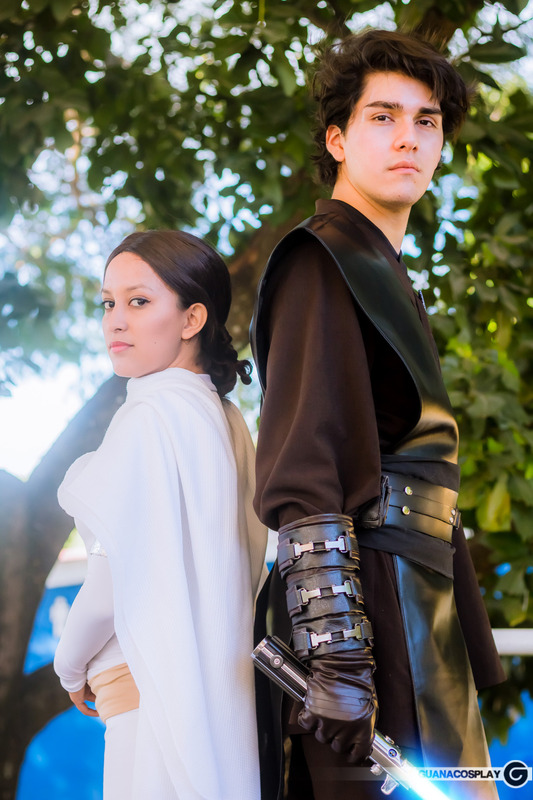 This amazing Padmé-inspired dress was one of the entries. No Star Wars entry won but that’s because I wasn’t on the panel. You can check out her whole gallery here. It was actually in last week’s episode of SyFy’s “Heroes Of Cosplay,” not the one that aired 8/27, but there were some clips from the recap of the 8/21 episode. The show follows a group of BNFs, er, cosplayers who compete in contests on the convention circuit. One competitor–not a featured member of the “cast”–got on the stage at Seattle’s Emerald City Comic Con in a rather splendid Queen Amidala getup from TPM. You can see a pic of it here. There are a bunch more of their pictures on the Anidala deviantART page. Nice job!